A lax, flabby belly is not considered to be a source of pride. Whether it has been caused by age, genetics, pregnancy, or extreme fluctuations in weight, a tummy tuck procedure (also known as abdominoplasty) can help to eliminate that displeasing looking, bulging tummy in a safe manner. When excess fat or skin protrudes over your jeans, it can make you feel self-conscious and embarrassed. If you are looking to obtain a flatter, more appealing looking stomach, a tummy tuck could be the answer you’ve been seeking. Dr. Racanelli is an award-winning, board-certified plastic surgeon with years of experience, specifically in regards to tummy tuck procedures. Dr. Racanelli aims to provide among the finest tummy tuck Brooklyn can provide. The tummy tuck procedure involves an incision along the lower abdomen. Routinely, this incision is made below the bikini line, so it may be strategically concealed by clothing or bathing suits. What distinguishes Dr. Racanelli’s tummy tucks from others is that he designedly places his incisions much lower than other surgeons, resulting in a scar that is far easier to hide. The benefit of having Dr. Racanelli perform this procedure is that he uses an advanced technique, where instead of a “single-layer plication,” Dr. Racanelli employs a “multi-layer plication”. This includes tightening of the muscles, and abdominal tissue in multiple layers. Many other surgeons do not use this technique, as they do not have the proper skill or training that Dr. Racanelli has worked to acquire. Additionally, Dr. Racanelli implements complimentary liposuction techniques to the flanks (which are more commonly known as “love handles”) with most every abdominoplasty procedure, providing you with that much sought-after “hourglass” shape. His patients receive liposuction as an inclusive element of the overall tummy tuck procedure. The outcome of the multi-layer technique, in addition to the complimentary liposuction, is a flatter, more youthful-looking abdomen, giving you a smaller, tighter waistline that enhances your beautiful curves. 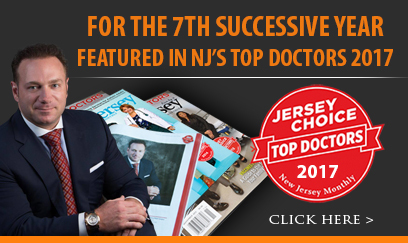 Dr. Racanelli has gained a reputation as one of the best Brooklyn plastic surgeons, delivering an abundant amount of tummy tucks throughout New Jersey. Those who have not seen their desired results from diet and exercise will find that a tummy tuck may be exactly what they need to bring about their physical aspirations, and finally feel happy with their appearance. While a tummy tuck is often done for cosmetic reasons, there are medical benefits that can add an additional layer of value to the procedure. A tummy tuck is often sought to recover the hourglass shape of the pre-pregnancy body. It is the primary step of a trio of procedures called a mommy makeover. The other two parts are breast augmentation and liposuction. Dr. Racanelli is a board certified plastic and reconstructive surgeon. He takes great pride in delivering among the best abdominoplasty Brooklyn has available. Having received many years of additional advanced surgical training , he can deal with any connected conditions associated with your tummy tuck and give you the look you’ve always wanted. Stress urinary incontinence is a condition caused by the stress of vaginal childbirth. Women with this condition are unable to control leakage from the bladder caused by sneezing, exercising or laughing. During your abdominoplasty, soft tissue near the pelvic area is used to create a slight bladder obstruction, which reduces incidences of stress incontinence. A ventral hernia is caused when the abdominal wall is weakened either through stretched muscles or an incision, allowing a portion of intestine or abdominal tissue to bulge through the opening. Pregnancy, caesarian section, appendectomy and massive weight loss are common causes of ventral hernia. Having a tummy tuck addresses the issue that allows the formation of a hernia, weakened abdominal muscles. During the procedure, the muscles are strengthened and tightened, repairing the hernia while also creating a flat abdomen. Lordosis is caused when the abdominal muscles are not stabilizing the spine, thus causing a sway back shape. This can lead to alignment problems in the lower back, mid back and the neck. Tightening the muscles is a major aspect of a tummy tuck and many patients report enjoying improved posture as a bonus from having a tummy tuck. Tummy tuck surgery is becoming increasingly popular due to improvements in surgical technique, anesthetic drugs and pain medication for recovery. Patients not only enjoy a flatter tummy but can also handle certain medical conditions during the surgery thus increasing quality of life. In some cases, insurance may cover the cost addressing the strictly medical issues. Dr. Racanelli has a reputation for providing among the best tummy tuck Brooklyn can provide. His signature low incision creates an almost invisible scar, which is easily concealed with clothing. Enhancing the surgical outcome by addressing medical issues such as hernias is what sets him above the competition. During your consultation, Dr. Racanelli will thoroughly discuss your specific goals and needs. Any concerns and personal preferences for how you would like to look after the procedure should also be brought up at this time. During the consultation, he will assess your options, educating you along the way so that you can make an informed decision. If you would like to learn more about the top tummy tuck Brooklyn or New Jersey has to offer, you can request a consultation online. Or feel free to call the office directly at (888) 982-3309 and one of our staff members will be happy to assist you.